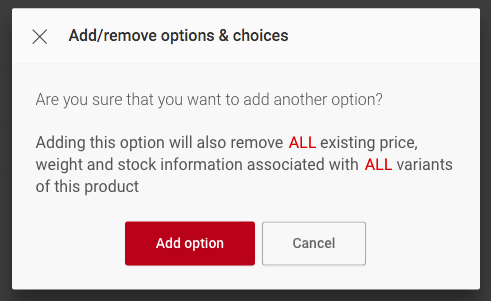 When adding a product to your store, you have the option to add in the different variants of the item - for example, size or colour - which will soon add up and make your product variants much more difficult to manage. Instead of doing this for every item, consider making some of the variants into separate products. For example, if you sell one style of t-shirt in five different colours, list the different colours as separate items. Now, the only variants of each shirt will be the different sizes, and managing them will be much easier. 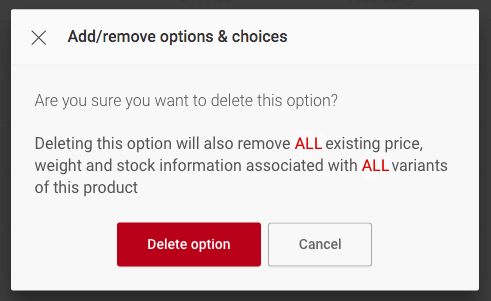 Adding additional options will remove all existing variants.